Description: The golden age of radio inspires an innovative lighting design with a heavy art deco influence. 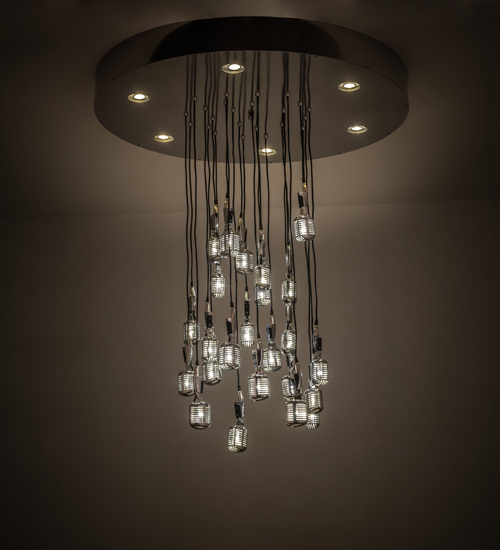 This eclectic pendant features 24 unique ribbed microphone styled luminaires which are illuminated with G4 2.2 watt LEDs and cascade downward with hang straight cords from a large round canopy. The canopy is embedded with six downlights, each using a 5-watt MR 16 LED lamp. Handmade in the USA, this fixture is available in custom sizes, designs and finishes, as well as dimmable lamping options. The pendant is UL and cUL listed for damp and dry locations.